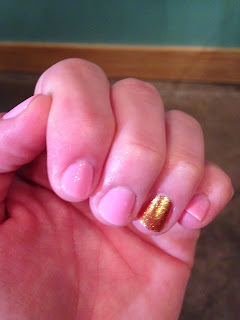 Mimicking one of my besties, it's baby doll pink with gold sparkles on the ring finger. Not exactly fall, but sometimes just what a gal needs to get through a week. And thanks to the meticulous work of the technicians at Stem Salon, it's been long-lasting and quite enjoyable. You deserve a bit of pampering yourself, dear friend...go get painted! I was thinking it was very breasted cancer awarenessy of you. :) Cute either way!